Copyright © 2013 Abdulraheem Giwa et al. This is an open access article distributed under the Creative Commons Attribution License, which permits unrestricted use, distribution, and reproduction in any medium, provided the original work is properly cited. Heterogeneous photocatalysis is an advanced oxidation process (AOP), which can be successfully used to oxidize many organic pollutants present in aqueous systems. This research studied the photocatalytic degradation of C. I. Basic Blue 66 (BB 66) in the presence of TiO2 P-25 Degussa as a photocatalyst. The influence of various parameters, such as mass of catalyst, initial concentration of dye and pH on the degradation process was examined. The degradation of the dye followed a pseudo-first-order kinetics according to the Langmuir-Hinshelwood model and decolourization was achieved within 80 min of light exposure. The mineralization of organic carbon was also evaluated by measuring the dissolved organic carbon (DOC) of the dye solutions. The textile industry consumes considerable amounts of water during the dyeing and finishing operations . Considering the volume discharged and effluent composition, the wastewater generated by the textile industry is rated as one of the most polluted among all industrial sectors of the world. Given the great variety of fibres, dyes, process aids and finishing products in use, the textile industry generates wastewaters of great chemical complexity, diversity and volume. During the last few years, newer and tighter regulations coupled with increased enforcement concerning wastewater discharges have been established in many countries . In order to cope with these new restrictions and due to the ineffectiveness of conventional biological treatment methods in decolourization and degradation of textile wastewater , the research interest was placed on establishing alternative, simple, low-cost technologies for the on-site treatment of wastewaters. Dye molecules consist of a chromogen and there are about 12 classes of chromogenic groups, the most common of which is the azo type that makes up to 60% - 70% of all textile dyestuffs produced . Research is focused on reactive dyes because they represent an increasing market share. A large fraction of the applied reactive dye is wasted due to dye hydrolysis in the alkaline dyebath, and finally, conventional wastewater treatment plants have low removal efficiency for reactive and other anionic soluble dyes . The degree of stability of reactive azo dyes under aerobic conditions is proportional to the structural complexity of the molecule and only a few azo dyes can be degraded aerobically . In order to overcome this problem, azo dyes can be degraded under anaerobic conditions to give potentially hazardous and carcinogenic aromatic amines, which are not further metabolized anaerobically, but are successively degraded under aerobic conditions [2,5]. Hitherto, dye removal methods include chemical, oxidative or most commonly active sludge biochemical processes. Adsorption and chemical coagulation do not result in dye degradation and create an ongoing waste disposal problem. The chemical oxidation treatment is usually effective towards the destruction of chromophoric structure of dyes. In this way the dye solution colouration is removed, but often, complete mineralization is not achieved. Chlorination and ozonisation cause decolourization by means of chemical reactions. The by-products of chlorination are chlorinated organics that may be more toxic than the dye itself [3,4]. Problems with using ozone include its instability and its hazardous nature due to strong and non-selective oxidizing power. Therefore, a post-treatment destruction unit must be used to prevent unreacted ozone from escaping into the atmosphere. Moreover, since dyes are intentionally designed to resist degradation in order to give them high fastness properties, activated sludge systems do not achieve significant dye degradation, as already mentioned. So it is obvious that one single treatment cannot eliminate all contaminants in wastewater and the optimal combination of various treatment processes is today’s challenge [3-6]. Heterogeneous photocatalysis is an advanced oxidation process (AOP), which can be successfully used to oxidize many organic pollutants present in aqueous systems. AOPs are all characterized by the same chemical feature: production of radicals (•OH) through a multistep process, although different reaction systems are used. These radicals show little selectivity of attack and are able to oxidize various organic pollutants due to their high oxidative capacity (reduction potential of HO• Eo = 2.8 V) . Photocatalytic degradation involves the use of certain semiconductors as catalysts for the production of the above mentioned radicals and has proven to be an effective method for mineralizing commercial dyes without having any of the certain drawbacks mentioned above. Experimental observations indicate almost complete oxidation of most of the organic compounds to CO2, H2O and inorganic anions via photocatalytic processes. The use of titanium dioxide (TiO2) as a catalyst for the photo-oxidation of organic compounds has received much interest because TiO2 is plentiful, inexpensive, powerful and environmentally friendly. The photocatalytic oxidation of dyes is generally monitored by measuring the decolourization rate, the organic content reduction and the by-products obtained at the different photocatalytic stages. However, the qualitative and quantitative analysis of all individual by-products is often incomplete, due to technical or financial limitations. Additionally, the generation of by-products that may be more toxic than the parent compounds and phenomena, such as bioavailability, synergistic or antagonistic effects, make toxicity testing of the photocatalytic process essential [8,9]. 3) Evaluate the degree of mineralization. The commercial dye used in this study was Basic Blue 66 (BB 66), Figure 1 (Molecular formula = C22H28Cl3N5O2SZn, C. I., 11075; CAS Number: 12221-38-4, λmax = 610 nm, Mw = 589.3 g/mol) and was used without further purification. Solutions were prepared by dissolving a defined quantity of the dye in distilled water. Titanium dioxide P-25 Degussa (80% anatase, 20% rutile, particle size: 21 nm) was used as supplied. The experimental set-up was based on the schematic diagram shown in Figure 2. The apparatus employed in the photocatalytic experiment consists of the light source and the photoreactor. The setup consists of a UV chamber equipped with a UV lamp (Philips). An exhaust fan was fitted on the sidewall of the chamber to maintain the temperature. The reactor used was cylindrical in shape and made of borosil glass, with an approximate capacity of 400 mL. The reactor was placed on the stirrer. Figure 1. Structure of BB 66 dye. Figure 2. The view of the photo-reactor used. W/10/2P Hg, maximum absorption wavelength at 254 nm) bulb made in Poland. Then 200 mL of the required concentration at an adjusted pH of BB 66 was allowed to pass into the reactor from the top of the chamber. The photoreactor was placed in a black box to shield the researcher from direct contact with the UV light. The reactor content was agitated at 610 rpm using a magnetic stirrer and air was introduced into the reaction medium through an air pump. Samples were withdrawn from the irradiated solution at preset time intervals, ﬁltered with 0.45 μm Whatman PTFE ﬁlter and analyzed for the concentration of the BB 66 in the solution at 610 nm (the dye maximum absorption wavelength) using a computer software attached to UV-Vis spectrophotometer, UV-1700 PharmaSpec, Shimadzu. 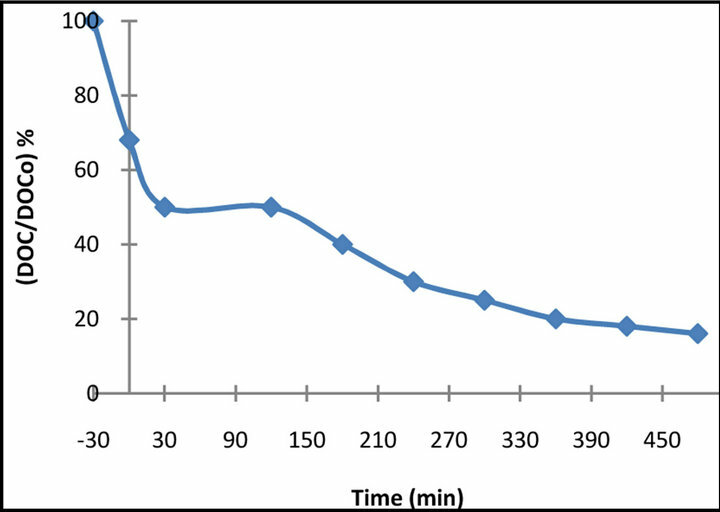 At different reaction times, 2 mL sample were taken and the remaining BB 66 was determined using a spectrophotometer at λmax= 610 nm. The percent decolourization efficiency (%) was expressed as the percentage ratio of disappearance of colour concentration to that of the initial one. where DE is the decolourization efficiency, A0 and At the absorbance before irradiation and at any time of exposure respectively. In order to evaluate the extent of mineralization, dissolved organic carbon (DOC) measurements were carried out by a Shimadzu TOC analyzer. 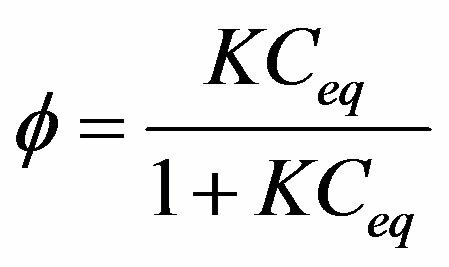 where kr is the observed reaction rate constant; K, the constant for the adsorption of the organic substrate and Ceq, the equilibrium bulk solute concentration [10,11]. Experiments were carried out using various initial concentrations of dye (10 - 50 mg·L−1). The results depict the decrease in dye concentration during the dark adsorption-desorption equilibrium and the additional decrease caused by subsequent illumination of the pre-equilibrated suspensions. It is, therefore, clear that BB 66 strongly adsorb on the TiO2 particles and the extent of adsorption, under given pH values, depends on initial dye concentration and varies from about 10% to 90%. This is the reason why the equilibrium concentrations of the dyes are used, instead of the initial ones, in the kinetic study. The r0 values for dye BB 66 was independently obtained from the curve, from the linear fit using only the experimental data obtained before 20% of dye removal was achieved. This was done in order to minimize variations as a result of competitive effects of intermediates, pH changes, etc. As indicated in Figure 3, the plot of the reciprocal initial rate ro−1 as a function of the reciprocal of initial concentration yields a straight line. The constants of the Langmuir-Hinshelwood model for the dye showed that kt = 14.4 mg·L−1 min−1 and K = 0.005 L·mg−1, as they were evaluated according to the Equation (4) also from the slope of the straight line R2 = 0.99. Figure 3. Linearized kinetic plot for the photocatalytic decolourization of BB 66 dye. Figure 4. Plot of the photodecolourization of 50 mg·L−1 of BB 66 dye solution in the presence of 1g·L−1 TiO2 with different pH values against irradiation time. tions, respectively, have been used. The effect of the solutions’ pH on the degradation rate can be explained mainly by the modification of the electrical double layer of the solid-electrolyte interface, which consequently affects the sorption-desorption processes and the separation of the photogenerated electron-hole pairs in the surface of the semiconductor particles. In acidic suspensions, the adsorption of the dye on the TiO2 particles was significantly increased compared to the extent of adsorption in neutral or alkaline suspensions. This is attributed to the fact that TiO2 shows an amphoteric character so that either a positive or a negative charge can be developed on its surface. The point of zero charge for the used TiO2 P-25 is pH ≈ 6 so below this value the surface of the particles is positively charged and above it is negatively charged. Because adsorption is favoured in low pH (the extent of adsorption is almost four-fold for the dye compared to the one at neutral pH values), it can be assumed that molecules of both dyes are negatively charged so an electrostatic attraction is developed. However, the strong adsorption leads to a major decrease of the active centers on the catalyst’s surface, which means the absorption of the light quanta by the catalyst is decreased as well. This could be the reason why the initial rate of the decolourization is lower in acidic solutions. Moreover, it could be assumed that strong adsorption causes a multilayer of dye molecules around the catalyst particles and as a result these molecules are not in direct contact with the catalyst, so they do not participate in the photo-oxidation process. On the other hand, in alkaline solutions a decrease of the initial rate is also observed, reflecting the difficulty of the dye molecules to approach the catalyst surface. As a result, the optimum pH among those tested under these certain experimental conditions appears to be the neutral one. Similar observations have been made by other researchers for dyes and several other types of pollutants [11-13]. 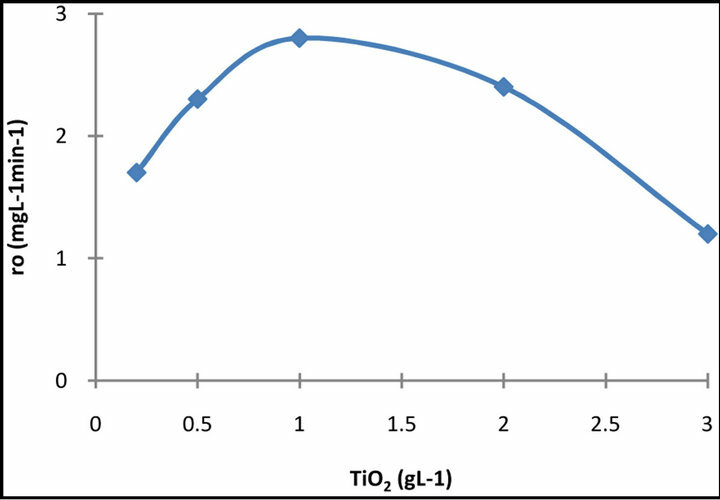 The influence of the catalyst concentration on the decolourization kinetics of the dye solution has been investigated using different concentrations of TiO2 varying from 0.25 to 2 g·L−1 and the results are presented in Figure 5. 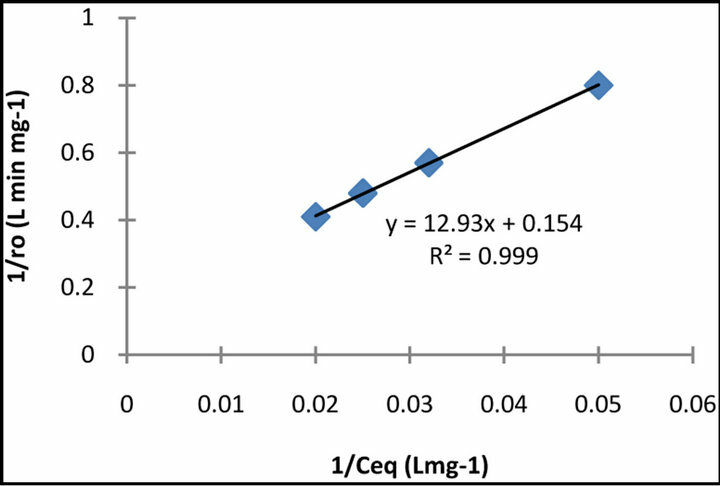 It is obvious that the rate of degradation increases with an increase of the concentration of catalyst up to a limit above which no improvement is obtained and the curves formed are reminiscent of a Langmuir type adsorption isotherm. A similar observation has been made by other authors, as well [12,14-17]. The increased degradation rate that follows the increase in the catalyst loading can be attributed to the fact that a larger amount of photons are, thus, adsorbed thereby accelerating the process. The plateau, which is recorded after a certain amount of catalyst is added, may be a consequence of the fact that the reaction takes place on dye molecules adsorbed at the TiO2 surface. When all the dye molecules are adsorbed on TiO2 no improvement is achieved by adding more catalyst. The decrease in efficiency, which is observed, may be due to an increasing opacity of the suspension and to an enhancement of the light reflectance, because of the excess of TiO2 particles . Moreover, particle-particle interaction becomes significant as the amount of particles in solution increases, thus, reducing the site density for surface holes and electrons, because the rate of deactivation of activated molecules by collision with ground state titanium dioxide increases [16,17]. Figure 5. Dependence of the initial rate r0 of decolourization on the concentration of the catalyst. Figure 6. 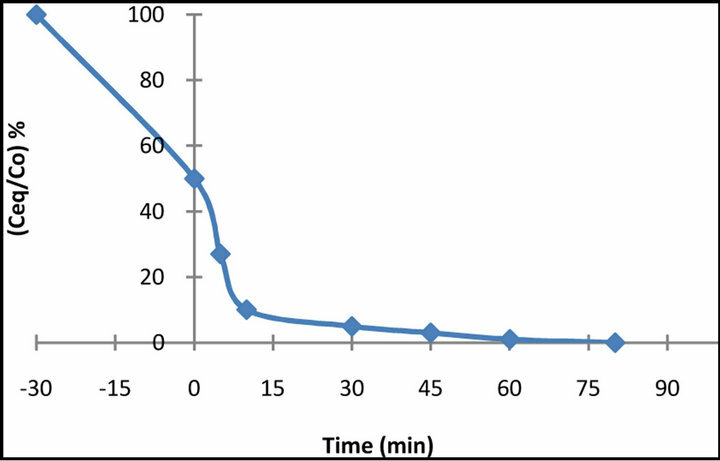 Photodecolourization of 50 mg·L−1 BB 66 solution as a function of irradiation time in the presence of 1·g L−1 of TiO2. is clear that, under the certain experimental conditions, in the presence of TiO2 the disappearance of the dye was achieved in less than 90 min of illumination. The disappearance of the λmax absorption band of BB 66 (610 nm), which was measured spectrophotometrically, suggests that the chromophore responsible for the characteristic colour of BB 66 dye broke down during the process. In Figure 7, the removal of DOC took place after about 8 hours illumination. After 120 min of illumination the removal of DOC reached 50%. At this time BB 66 was complete, suggesting the presence of intermediates, which undergo further photocatalytic oxidation . The complete decomposition to CO2 via photocatalytic reactions is of great significance in water treatment because it is the unequivocal evidence of the total destruction of organic compounds in water. For this reason, the extent of mineralization of the dye was studied by measuring the dissolved organic carbon of the illuminated suspensions. 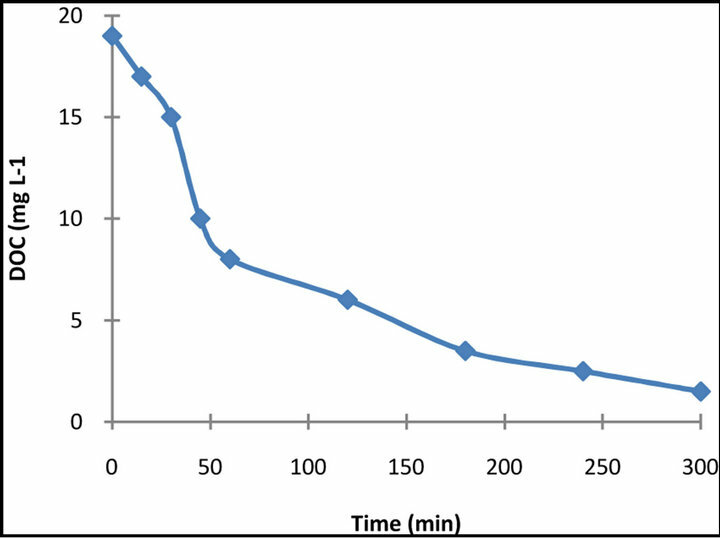 The results obtained after 15 min exposure time of the DOC measurements for the dye is presented in Figure 8. It is obvious that decolourization of dye solutions is not followed by the same extent of mineralization. That means that the dye decomposes to smaller organic intermediates that are still present in the solution. Within a longer illumination period though, a significant removal of DOC is accomplished (almost 85% - 90% DOC removal for the dye was accomplished for 5h illumination), which means that prolonged illumination can probably lead to complete mineralization. Figure 7. DOC removal for 50 mg·L−1 of BB 66 solution vs. irradiation time in the presence of 1 g·L−1 TiO2. Figure 8. DOC removal of 50 mg·L−1 dye solution in the presence of 1 g·L−1 TiO2. Langmuir-Hinshelwood model. 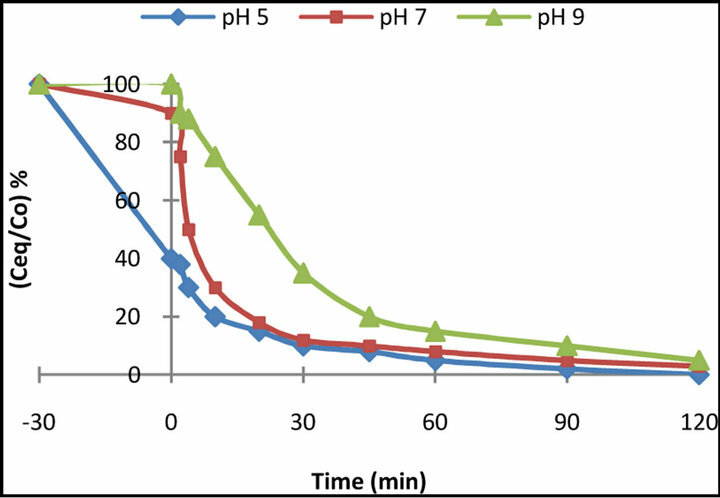 Parameters, such as concentration of the catalyst or initial pH value play an important role affecting the reaction rate, and DOC was almost 80% removed after 5 h of illumination. The application of the TiO2 photocatalytic method for decolourizing and mineralizing BB 66 proved to be efficient. A. Giwa, U. G. Akpan, P. O. Nkeonye, K. A. Bello and E. G. Kolawole, “Decolorization and Mineralization of Reactive Violet 1 by UV-Photolysis in the Presence of Hydrogen Peroxide,” Nigerian Journal of Materials Science and Engineering, Vol. 2, No. 1, 2011, pp. 80-89. A. Giwa, P. O. Nkeonye, K. A. Bello, E. G. Kolawole and A. M. F. Oliveira Campos, “Solar Photocatalytic Degradation of Reactive Yellow 81 and Reactive Violet 1 in Aqueous Solution Containing Semiconductor Oxides,” International Journal of Applied Science and Technology, Vol. 2. No. 4, 2012, pp. 90-105. A. Giwa, P. O. Nkeonye, K. A. Bello and E. G. Kolawole, “Solar Photocatalytic Degradation of Acid Blue 29,” Journal of the Chemical Society of Nigeria, Vol. 36, No. 1, 2011, pp. 82-89. A. Giwa, U. G. Akpan and B. H. Hameed, “Optimization of Photocatalytic Degradation of an Anthraquinone Dye using Design of Experiment,” Journal of Engineering Research, Vol. 17, No. 3, 2012, pp. 20-31.